Our Parties are Educational and Fun! Pow!Science! Birthday Parties are 2 hours of entertaining, enlightening and hands-on FUN at the coolest party venue in Rhode Island! We had my son's birthday party there and he and all his friends LOVED this place...even the adults had fun. -Diane M.
Thank you for a wonderful Lego Party. The kids had tons of fun. Nicholas said, "it was my best party ever!" My husband keeps commenting on how well run it was. He said it was his favorite too. -Carla J. A 2 hour party at Pow!Science! costs $185.00 for up to 15 kids. Additional kids are $5.00 each. A 1 hour party at your home costs $195 for up to 15 kids. Additional kids are $5.00 each. In addition, a $20 travel fee is added if your home is located more than 45 minutes from Wakefield, RI. Unfortunately, we cannot perform parties that are more than an hour's drive from Wakefield, RI. We offer parties on the following days and times. Saturdays fill up fast. We'll be happy to answer any additional questions you have and discuss all the options with you. A $50.00 Deposit is due upon registration, non-refundable if you cancel within 3 weeks of your party date. Sorry, but we cannot "pencil in" tentative party dates. You are not officially booked until your deposit has been received. You don't have to pick a theme when you book a party but we do need to know a full week in advance. If you are undecided our staff will be more than happy to discuss the options with you in greater detail. We can take care of the little Extras that make a party truly memorable! Add a Pyrotechnic Candle, Indoor Roller Coaster and more. Our Awesome Extras! are listed below. Click here for a printable (pdf) invitation or create your own. 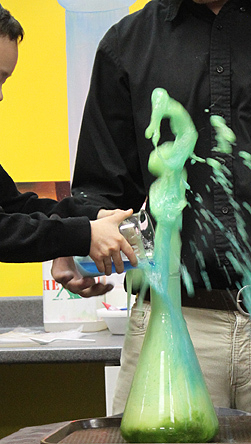 Color changing chemistry, color mixing and bubbling beakers are just part of the fun! Kids create a gooey blob of brightly colored GOOEY SLIME to take home, and the birthday child performs an amazing Science Magic Trick right before everyone's eyes! Glue used to make slime is Gluten Free. A single Latex Balloon is used during a demonstration at this party. Big Kid Chemistry! Let's Blow Stuff Up! Appropriate for kids turning 8 and older. Soda Geysers, mysteriously floating bags and the weirdest bar of science-soap you've ever seen kick off this sequel the our most popular program ever - Alchemical Chemistry! Witness a real-live Science EXPLOSION! Bubble a mystery-potion all over the table! The action never lets up as we finish it off by sending film canisters (remember those?) into high-flying orbit like mini-rockets shooting all over the place! As there is no "Take Home" item made during this party, Goody Bags are included in your party price! Build bridges, build castles, build towers to the sky! Appropriate for kids turning 5 to kids turning 12 (we can scale the complexity of the building projects to suit the age of the children attending). Building is an activity that all kids love, and at the Citiblocs Block Party, the sky is literally the limit! We'll show the kids how to play games and use precision-cut wooden blocks in creative and innovative ways that will have them wishing the party would never end! Think your kids are past playing with blocks? Give ours a try!! Party like a Parasaurolophous! Appropriate for kids turning 5 to turning 8. Kids learn about plant and meat-eating dinosaurs, simulate dinosaur digestion, make two kinds of fossils and find the other members of their dinosaur herd! 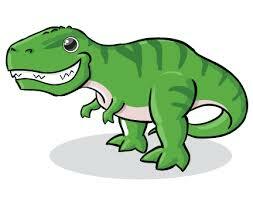 Each participant makes an awesome etching of their favorite dinosaur or fossil! The Volcano Party! Appropriate for kids turning 5 and up. Earthquakes, tornadoes, volcanic eruptions! Kids model and demonstrate the phenomena that shape our ever-changing planet while learning about plate tectonics, meteorology and more! Every participant takes home their own erupt-able Volcano! The Earthquake Experiment performed during "Dynamic Earth" uses a Milky Way candy bar. Milky Way bars DO NOT CONTAIN Peanut products, but since they are manufactured in the same facility as Snickers (which do contain peanuts), we would like to call this to your attention. As a rule, our instructors do NOT allow any participants, even those without allergies, to eat the Milky Way. Fizzing, Foaming, Bubbling Reactions and MORE! Appropriate for kids turning 4 to kids turning 8. It's everything kids want from a "Science" party! This includes real test tubes and flasks along with mysterious potions that foam and bubble! We also play a "bug hunt" game and learn about natural selection. Fizz... Bubble... POW!... Science! Let's Get Building! Appropriate for kids turning 7 and up. Each participant will build the custom-designed Pow!Science! Zipline Runner*! Even seasoned Lego Veterans will love the simple but innovative Zipline Runner we've designed for this party. Each participant will build their own Zipline Runner, and zzzZZZZIP them down the line at high speed! Young Engineers will then divide and conquer, building a Straws and Connectors Tower that reaches up, up -and over the Zipline, creating a tunnel for Zipline Runners to fly through! "The Lego Party"; one of our newest themes and it's getting everyone very excited. 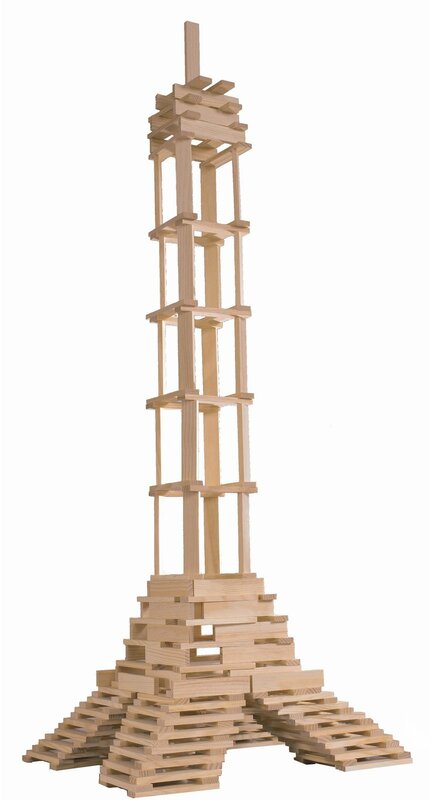 Did we mention that as a bonus building project we'll make and spin the World's Easiest Lego Battle Top? Less than 10 seconds to build! Incredible spin times!! Unlike our other themes, most of the time during this party the kids are up and moving around the room excitedly. This party tends to be a little noisier than our other party themes, and we welcome fun-spirited parents who want to join the action and help keep the Zipline Runners Zipping! Experience the Softer Side of Science with these Aromatic Experiments! Appropriate for kids turning 7 and up. Participants test their senses as they try to identify 5 deliciously scented test tubes and perform fascinating, FIZZING Chemistry Experiments that introduce and explain the ingredients of their final project - a scented fizzing bath bomb! Turn your party guests into a human electrical circuit! Worried if your boy-guests will have a good time at this party? Don't be! The chemistry experiments here don't pull any punches! Be a Spy! Appropriate for kids turning 8 and up. Spies in training will learn to code make and break, and take a record their own fingerprints! 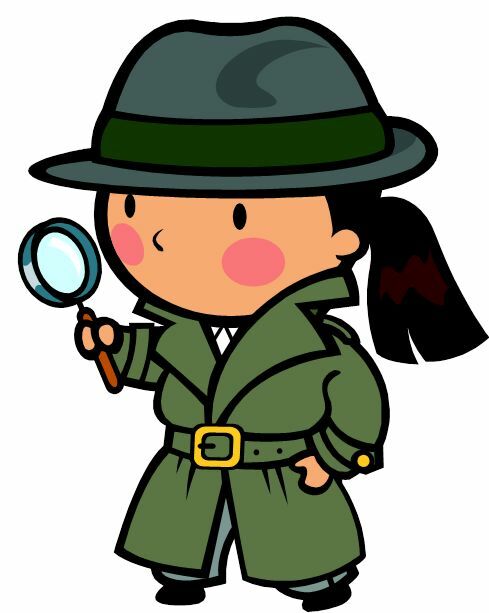 Secret-Agents-in the Making will also perform an exciting Chemistry Experiment to test their powers of observation. Comfortable reading and writing skills are necessary for this party. Soup up your science party with any of these Awesome Extras! Blast Off With A Stomp Rocket Launch! Encapsulate your guest inside of a GIANT BUBBLE with this ultimate add-on! Epic photo op for your birthday child & guests as they giggle inside the biggest bubble you've ever seen! Add on our most popular Science Experiment to any party - Stretchy, Bouncy SLIME! Diet Coke & Mentos Erupting Geyser!! Watch as your child blasts an incredible Geyser of Diet Coke straight up to the ceiling (with the able assistance of your Pow!Science! Party Professional). Kids LOVE "panning for gold" in our running water Mining Sluice and discovering an assortment of treasures such as Amethyst Crystals, Fool's Gold & More! The Birthday Boy/Girl always gets an Extra Special Mineral in their Birthday Mining Bag! Of course, you only pay for kids who mine! Kids take turns pulling keys out of the Candy Blaster! When the right one is selected, everyone blasts off with a (safe) explosion of candy. Add on costs below. Light this candle and it shoots a Roman Candle nearly 1 foot into the air, pops open with candles lit, plays the Happy Birthday Song and rotates. Unbelievable! Assorted Colors Available. Roll each kid down a big, indoor Roller Coaster Ramp and watch them crash into a big pile of bean bags! Birthday child gets 2 turns, of course. We recommend Kingston Pizza delivered right to your party! Mention Pow!Science! and receive a 10% Discount from Kingston Pizza too! A: Cake & refreshments & paper goods(cups, plates, napkins etc) and candles. We have a "dorm room" sized refrigerator (short cube shaped) to keep juice boxes, Hoodsie cups etc. cold. Keeps ice cream frozen. Does not fit Ice Cream Cakes! A: Please plan to arrive about 15 minutes prior to the start of your party. This makes sure that we have time to prepare the party room for you and your guests including cleaning up from the party before yours! Q: Wow, my party's Science Instructor is AMAZING!! Can I tip him or her? A: Sure! We certainly encourage tipping your instructor if you feel they did a great job! You can tip them directly or we can even add it on to your party balance. Q: Any restrictions on what sort of food I may bring? A: Almost none. It's your party. Bring whatever you like; no alcoholic beverages are permitted. Q: Do you charge for adults? What about toddlers? A: We absolutely do NOT charge for adults! Toddlers are generally not counted towards your headcount unless they participate in the experiments. For example, at the 'Volcano' Party, we count volcanoes at the end. Whoever made one gets counted. Q: Should I bring a table cloth? A: Only if your child wants a certain theme (Spiderman, Star Wars, etc). The party tables are covered with heavy white craft paper during the science experiments. We remove the paper and sanitize the tables after the Science & before you serve the refreshments. The tables are brightly colored plastic, and don't need to be covered. Q: What about Goody Bags? A: You can certainly bring your own, but we also provide them as an add-on service with the Candy Blaster! Each participant receives a bag pre-loaded with sciencey goodies (such as rainbow glasses, glowing lizards, globe keychains, bouncy balls, punch balloons etc) and then we play with the Candy Blaster! Please Note: The following party themes include Goody Bags as a take home item: Chem 201, Citibocks, Fizz-Bubble-Pow, and LEGO Zipline. Q: Do you have an incredible, pyrotechnic Birthday Candle that shoots sparks and plays the Happy Birthday Song? Contact us any time to discuss your party. *Please bring your invoice with you. Thank-you.